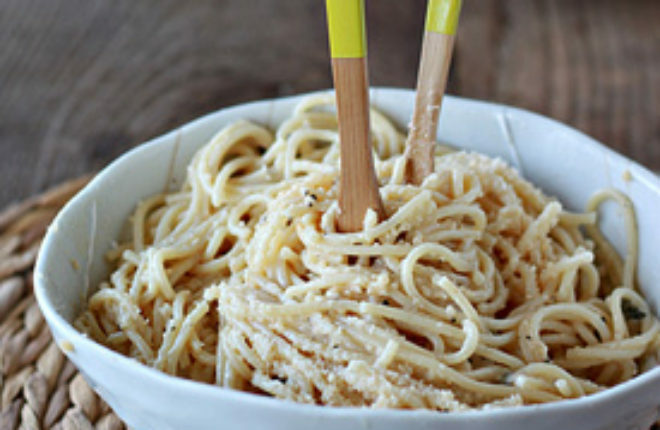 Nutty brown butter, grated Parmesan cheese, and pasta water mingle with al dente spaghetti to create pure magic. Best of all, this dish is ready in a matter of minutes. 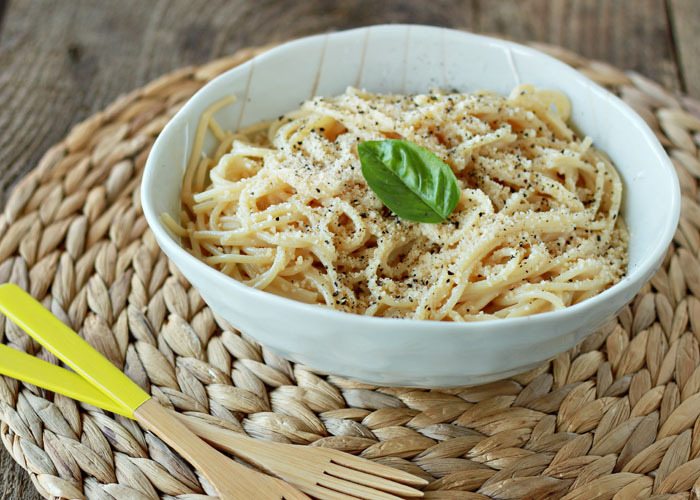 Have you heard of Cacio e Pepe? Other than not really knowing how to pronounce it, it’s also a dish that, strangely, until now, I’ve never been able to prepare successfully. I say that’s strange because it’s the simplest of simple pasta dishes, supposedly. Spaghetti noodles tossed with Pecorino Romano, black pepper, and a little pasta water. That’s it. And it’s heaven. I’ve enjoyed it when prepared elsewhere by people who know more than me, and it’s just absolutely perfect. Anyway, I figured it out, and I feel like a total dork. The cheese should be grated, not shredded. As in, grated on a very very fine grater so that it’s pretty much pulverized, or bought like that in a tub at the store. That’s it. So instead of the cheese evenly disbursing itself throughout the pasta, my freshly shredded cheese would clump together in a big, giant mess. It’d taste okay, but it definitely didn’t look right. And the dishes were h-e-double-hockeysticks to clean. Yup. Grated cheese. That’s it. So basically, I solved my Cacio e Pepe mystery when developing this dish, which is a tiny bit more complex, but not by much. I add nutty browned butter and Parmesan instead of Pecorino Romano. Not only does it work perfectly, it’s also utterly delicious in its simplicity. Sometimes I like to throw a smattering of fresh basil in and/or top my portion with halved cherry tomatoes and sometimes I top my guy’s portion with chopped cooked bacon. It’s also pretty awesome as-is. Either way, it’s on the table in 20 minutes from start to finish, and it is so, so good. 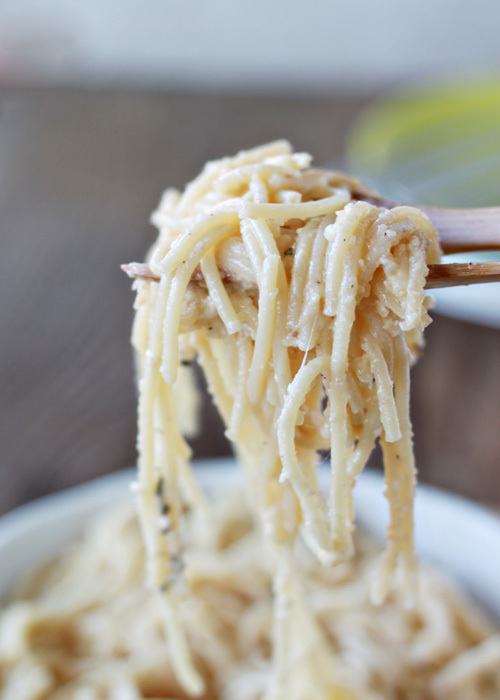 Spaghetti noodles cooked perfectly al dente, salty Parmesan cheese, cracked black pepper, and that distinctly rich and aromatic quality that only brown butter lends to a dish. Meanwhile, set a large pot of water to boil. Cook the pasta to al dente per package instructions. 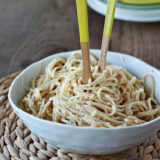 Using tongs, lift the cooked spaghetti noodles out of the water and place in a large pasta bowl. You can drain the noodles in a colander, too, but remember to reserve some of the pasta water! It’s crucial for this recipe. Pour the browned butter and 1/4 cup of the pasta water over the noodles. Sprinkle with Parmesan and add a few turns of freshly ground black pepper. Using the tongs, toss well until all ingredients are incorporated and have mixed to coat the noodles with an almost creamy sauce. Add more pasta water – a couple of tablespoons at a time – if necessary to achieve this. Top with additional Parmesan cheese if desired. Serve immediately. Top individual portions with basil, bacon, or cherry tomatoes, if desired. This looks so yummy! It reminds me of the pastina my grandmother used to make for me when I was a kid – lots of butter and cheese. Comfort in a bowl! Can’t wait to try the added bit of black pepper – it’s my favorite spice! You really can’t go wrong with any combination of butter, pasta, and cheese :). I first made Cacio e Pepe when I saw the recipe on Amateur gourmet and it was so simple and delicious, I can’ wait to try your version! This looks so perfectly comforting, and I love how easy it is! I’ll definitely be making this for my housemates and myself this coming fall! 😀 Pinned! I always buy the shredded parm and I came to that same conclusion about the whole grating thing when making another recipe. So I pulsed it in the food processor until it was grated. 🙂 I LOOOOVE butter + noodles. Such a comfort food! 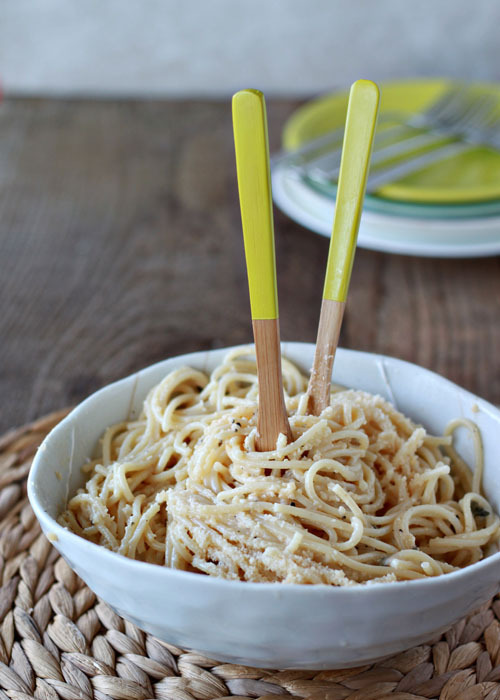 I love these…I think the brown butter makes butter noodles a little more grown up. Yum!! Looks absolutely delicious! Have you ever been to the Old Spaghetti Factory? They have a spaghetti & mizithra dish which is with browned butter and mizithra cheese (similiar to Parmesan but more flavor) and its absolute heaven. Ha, yes! That’s one reason why I need to stay *away* from that restaurant. 😉 So. Good. I made this last night, but I added broccoli that had been roasted with grated parm and red pepper flakes. The sauce was very easy to prepare, but o felt like something was missing. I think I was expecting it to taste like Alfredo, but it’s missing that creamy element. Its more buttery, almost oily. Needed a lot of salt too, but maybe it was the brand of parm I used. I might make this again, the presentation was gorgeous with the bright green broccoli. This looks scrumptious. I wish I had a huge bowl of it right now. I just wanted to say thank you so much for your blog and recipes! I found this recipe while doing my own search for vegan recipes to try out. Have you been allergy tested? I have been having really bad palpitations and difficulty breathing. I had the feeling it must have been something having to do with my diet. It turned out I had an allergy to cow’s milk. No other typical allergy symptoms, just the palpitations and trouble breathing. I’m so happy to see I’m not the only one who reacts to it this way. Hi Chrissy! I’m so glad you got to the root of your palpitations and trouble breathing (scary)! I bet it’s a relief to know the source, but if you love cheese and other dairy products like I do, I can relate to how it’s not easy cutting them out! I have not been allergy tested for foods, but I think that might be my next step. I still get them occasionally, but after cutting dairy, my palpitations reduced by a good 90%. So crazy. So quick and easy to make! I added peas and bacon bits. My toddler is gobbling it up! Use mizzithra cheese. Its better. This recipe is so good. I added a little fresh Kale in with the butter and that was so good.